Bookings for Cross Country Skiing in the Finnish-Russian Borderland are now open for winter 2020. 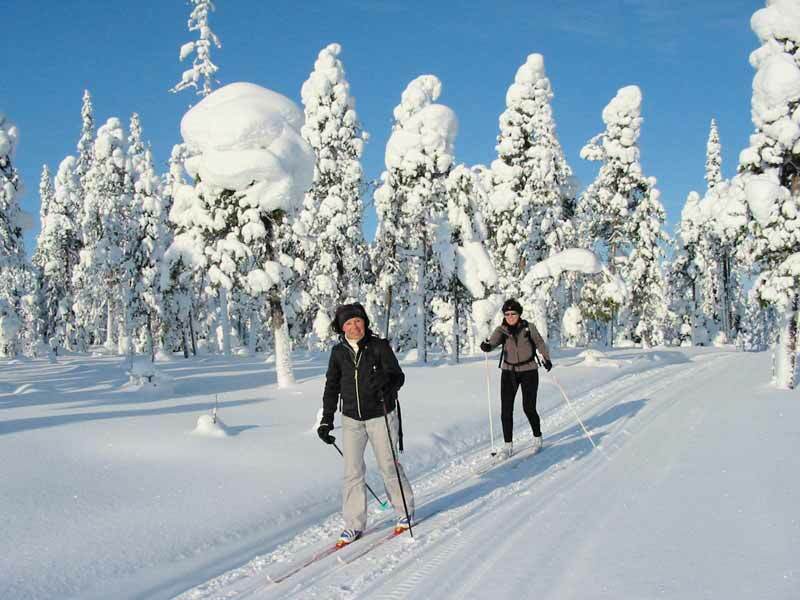 The border region of north-east Finland is a wonderful region for cross country ski touring, with a number of protected areas including the Hossa National Park and Martinselkonon nature reserve. Passing close to the border with Russia and with accommodation in cabins and local guesthouses along the route, this ski tour offers a choice of two itineraries at Medium or Medium-Hard level, covering a total of 100km or 150km over 5 days of skiing. Ski trails are prepared for you by a service snowmobile, allowing the flexibility for different members of the group to ski at different speeds if necessary. The tours take you through beautiful winter landscapes of old-growth forest, marshlands and frozen lakes. Photo: UT. Your main luggage is transported betwenen overnight accommodation, meaning that you need to ski with only what you need during the day and allowing you to enjoy to the full the experience of skiing through landscapes of ancient forests, ridges and frozen lakes. Accommodation is at a selection of guesthouses and cabins along the route. On most nights, sauna is available to soothe any aching muscles from the day's skiing, including one location with ice hole to take a dip when you overheat! Option 1 (100km): This tour has daily distances 17-25km and covers total approx. 100km over the 5 days' skiing during the tour. The tour requires previous experience of cross country skiing and general competence with basic skiing technique and confidence negotiating short hills. Option 2 (150km): Offering an additional level of challenge with daily distances 25-42km and covering around 150km during the tour. 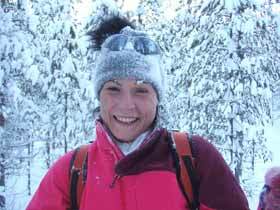 Suitable for experienced cross country skiers with a good level of fitness. Lunch is normally taken outdoors around the fire. Photo: UT. A visit to local reindeer farm on one evening, where dinner is served and you have the opportunity to learn about the lives of reindeer herders in Finland. A focus on locally-sourced produce with some of the overnight locations being particularly well-known for their cuisine. Being located relatively far north, you have good possibilities to see the Northern Lights during your week. 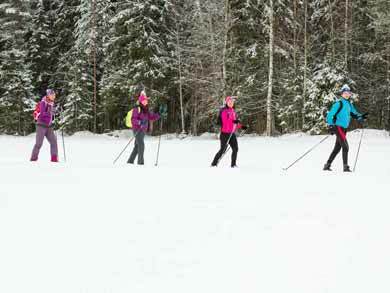 Cross Country Skiing in the Finnish-Russian Borderland is available on a number of scheduled dates for public tours and is also ideal as a private experience for groups on request. Transfers will meet Finnair flight AY497 from Helsinki arriving Kuusamo (KAO) airport in the evening (normally 21.30 - timings for 2020 to be confirmed when schedules are available). Transfer time to accommodation at Jaktonsalmi in Hossa National Park is approx. one hour. Guests arriving by train + bus from Helsinki to Kuusamo or overnighting locally in Kuusamo before the tour can have transfer from the bus station or from centrally-located accommodation. However, this must be advised latest two weeks in advance so that arrangements can be made. Guests travelling bus must plan arrival to fit flight transfer times above, with arrival no later than 30 mins before flight arrival. Pick-up time will normally be around 30 mins before flight arrival but will be confirmed by arrangement. Your first day of skiing on prepared tracks in beautiful Hossa National Park, a landscape of ridges, pine forests and frozen lakes. Lunch is taken at the part visitor centre with possibility to visit the souvenir shop. The afternoon is a chance to relax with a traditional Finnish sauna - an essential part of any adventure in Finland - with an ice hole for the brave available for a dip! A visit to a local reindeer farm in the evening completes the day, where you have dinner and learn about the life of a reindeer herder. Reindeer herding remains a central part of life for many Finns. Accommodation this night is at Rajakartano. After the creature comforts of the day before, you head for wilderness living today with the longest skiing distance of the week. Beginning on the tracks in Hossa, you follow a border guard's trail south through old-growth woodland, stopping for lunch around the open fire at Vieremäjärvi. Your accommodation for the night is the wilderness cabin at Kovavaara at the top of the hil, which offers an atmospheric taste of life in Finland in the 1950s. This accommodation has no electricity or running water. Skiing right along the Russian border zone (you'll see the warning signs prohibiting entry!) with views into Russia, you reach your accommodation at Arola, located very close to the border. This guesthouse has a deserved reputation for its wonderful food, mostly sourced from local ingredients, and dinner is taken in a traditional wooden house. Today you ski through the Martinselkonen reserve area (an excelllent place to see bears in the summer, though they will be hibernating now!) through a landscape of spruce forest and frozen marshland with lunch in wilderness hut en route. Accommodation for these last two nights of the tour is at the wilderness centre, a converted former border station. A day's skiing tour in the reserve completes your week, with a final sauna and farewell dinner in the evening to reflect on your adventure. Depending on tour dates (details to be confirmed for 2020 when schedules are released) transfers will either meet Finnair flight from Kuusamo to Helsinki departing around 14.00 or for some dates an earlier flight departing around 10.45. Guests departing by bus from Kajaani or overnighting locally after the tour can have transfer to the bus station or to centrally-located accommodation. However, this must be advised latest two weeks in advance so that arrangements can be made. Guests travelling by bus must plan departure to fit flight transfer times above, with departure time no earlier than one hour before flight departure. Transfers will meet Finnair flight AY415 from Helsinki arriving Kajaani (KAJ) airport in the afternoon (normally 17.15 - timings for 2020 to be confirmed when schedules are available). Guests arriving by train from Helsinki to Kajaani or overnighting locally in Ksjaani before the tour can have transfer from the train station or from centrally-located accommodation. However, this must be advised latest two weeks in advance so that arrangements can be made. Guests travelling bus must plan arrival to fit flight transfer times above, with arrival no later than 30 mins before flight arrival. Pick-up time will normally be around 30 mins before flight arrival but will be confirmed by arrangement. Transfer (approx. 2 hours) to your accommodation at the wilderness centre at Martinselkonen, a former border station, for dinner and introductory meeting for the week ahead. Your first day of skiing, heading east towards the Russian border, which you will see marked with yellow warning signs. You take lunch at one of the wilderness huts before returning for an evening sauna - the perfect way to end a day in the Finnish winter outdoors! Depending on logistical arrangements for your date, your accommodation this night may be either once again at the wilderness centre or in alternative accommodation of same standard nearby. 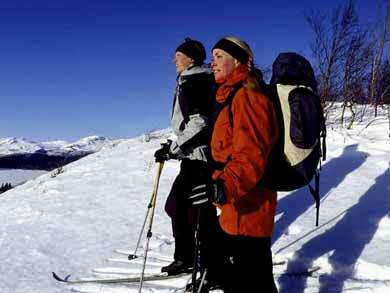 Today you ski towards Arola, through the Martinselkonen nature reserve. This area is rich in wildlife with many of Finland's most impressive animals found here. In addition to brown bears (which will of course be hibernating at this time) the reserve is home to wolves, lynx and wolverine, and though you will not see these animals as they are very shy, with luck you may spot tracks and signs in the area. The accommodation at Arola is famed for its food, and a dinner focusing on local produce is served in the traditional log house here. A day tour from Arola, taking you towards the wilderness hut at Teerlampi, where a lunch will have been prepared for you to enjoy around the open fire before returning to Arola for the evening. A long day today, skiing north along the border with lunch at wilderness hut at Kovavaara hill. Your goal for the day is the old border guard station at Rajakartano at the edge of Hossa National Park. A special activity awaits in the evening, when you visit a local reindeer farm for dinner and an introduction to the life of a reindeer herder. Today you are skiing on the tracks of Hossa National Park through its renowned ridged landscape and forests. Lunch is taken at the visitor centre with a chance to visit the souvenir shop before reaching your accommodation at the Jaktonsalmi cabin in the heart of the park. A final sauna provides a wonderful way to end the week, and you can even take a dip through the ice hole if you're feeling brave! Transfers will meet Finnair flight AY486 from Kuusamo (KAO) to Helsinki (normally departing 13.35 - timings for 2020 to be confirmed when schedules are available). NB: Hire of ski equipment is not included. Ski equipment (skis, boots and poles): Skis may be waxable or wax-free. Please specify on booking if you have a preference and also provide height, weight and shoe size. 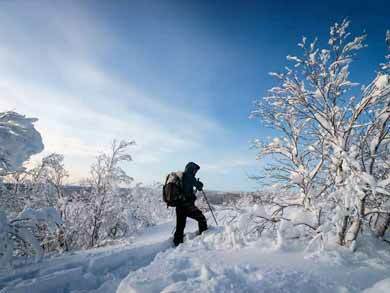 These tours are suitable for classic cross country skiing style only. You will be skiing in tracks made by snowmobile. The tour is suitable for skis of width ideally 44mm. You are welcome to bring your own skis or hire equipment as an optional extra. If you wish to bring your own boots but hire skis, skis provided will have Salomon SNS bindings and your boots must be compatible with these. Payment for ski hire is made locally on arrival in Euros. Sleeping accommodation is normally in shared 2-4 person rooms with shared WC/shower facilities. Day 1 and Day 2: Depending on logistics, accommodation may be at the same cabin for each night or two different cabins of similar standard. One cabin is a simple but well-equipped cabin on Lake Jatkonjärvi in the Hossa National Park, total 204 square metres with eight sleeping rooms, kitchen and dining area; central heating and sauna; barbecue area and outside fireplace. 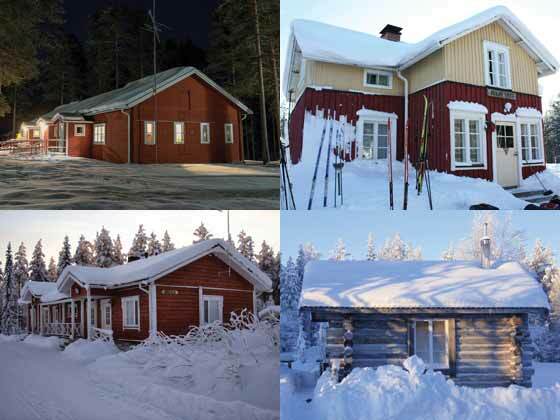 Second option is a former border guard station guest house with five sleeping rooms, living room, kitchen, shower and toilets and with sauna in separate building by lake with ice hole. Day 3: Wilderness cabin. The accommodation is simple but very atmospheric, with no electricity or running water. Dry outside toilet. The cabin is warmed with wood stove heating and sauna provides an opportunity to wash. The cabin has three main rooms with additional sleeping accommodation in two small log cabins. Day 4: Guesthouse with six rooms accommodating up to 14 persons. Dinner served in traditional log house. Days 5-6: Former border guard station guest house with 12 rooms for up to 26 persons. As all nights, accommodation is normally shared but 1-person rooms may be offered locally if available. Rooms here may have private or shared WC/shower facilities. Sauna available on total 5 nights, ice hole swimming available on 1-2 nights. Bedding and towels provided. Sleeping bag with mummy liner provided for night in wilderness cabin. Days 1-2: Former border guard station guest house with 12 rooms for up to 26 persons. As all nights, accommodation is normally shared but 1-person rooms may be offered locally if available. Rooms here may have private or shared WC/shower facilities. Day 3-4: Guesthouse with six rooms accommodating up to 14 persons. Dinner served in traditional log house. Day 5: Former border guard station guest house with five sleeping rooms, living room, kitchen, shower and toilets and with sauna in separate building by lake with ice hole. Day 6: Simple but well-equipped cabin on Lake Jatkonjärvi in the Hossa National Park, total 204 square metres with eight sleeping rooms, kitchen and dining area; central heating and sauna; barbecue area and outside fireplace. Option 1 (100km): All meals from dinner on arrival day to breakfast on departure day: 6 x breakfast, 4 x outdoor lunch and 1 x indoor lunch, 5 x dinner + evening snack on arrival day, 4 x afternoon coffee/snack during the tour. Option 2 (150km): All meals from dinner on arrival day to breakfast on departure day: 6 x breakfast, 4 x outdoor lunch and 1 x indoor lunch, 6 x dinner, 5 x afternoon coffee/snack during the tour. Experienced and knowledgeable guide accompanying you during the tour. Additional guide to prepare the ski tracks with snowmobile, transport luggage between overnight accomodation and assist with preparation of outdoor lunches. Local transfers between arrival/departure airports and start/end points of the tours in connection with fixed flight times as per itinerary. Transfer of main luggage between overnight locations. Whether you are hiring ski equipment as optional extra or bringing your own, glide and grip waxes, wax removal liquid and other equipment needed for waxing (such as an iron for applying glide wax and a heat gun for wax removing) are provided. A waxing bench will also be available. NB: It is not permitted to fly with wax removal liquid. If bringing your own skis, these can be waxed or unwaxed. Ski equipment (available to hire as optional extra). Minimm age 18 (younger participants aged 16-17 may be possible by arrangement). 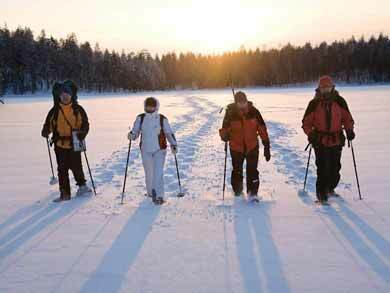 Both tours require previous experience of cross country skiing and a general good level of fitness. For both tours, members of the group can ski at their own pace - the group does not need to stay together. Faster skiers can follow the track made by the snowmobile and the guide can ski with slower skiers. So that the group arrives at the same time at lunch stops, faster skiers may be requested to start later in the day. On days where tracks are prepared by the service snowmobile (not all days), there is one seat available on the snowmobile in the event that a participant is unable to complete the daily distance or has blisters, etc. For Option 1 (100km) tours, you should have general confidence on cross country skiing, be able to manage short downhill sections safely and be comfortable with daily distances of 17-25km. Skiing time typically up to max. 7 hours including breaks. Option 1 tours may also be suitable for participants with limited cross country experience but good level of fitness and previous experience of other related activities such as ice skating or rollerblading. However, please note that the tour includes no formal instruction in cross country skiing techniques and is not a training course, though of course your guide will be happy to offer advice and tips on improving your technique. For Option 2 (150km) tours, you should have an advanced level of previous cross country experience and higher level of fitness and be able to ski at average speed of 7-8kmh to cover the distances required. Skiing time typically up to 8 hours including breaks and you should be comfortable with daily distances 25-42km. Option 1 has Medium level of difficulty, while Option 2 has Medium-Hard level due to the longer daily distances, but both tours require previous cross country skiing experience. Both tours have luggage transfer between overnight locations. Accommodation is of simple but comfortable standard with electricity and running water at most or all locations depending on the tour chosen. The tours have no minimum and are guaranteed to run from the first booking. Maximum 12 participants. Groups may be made up of participants from a number of countries. Fly to Helsinki for onward travel to Kuusamo or Kajaani (depending on tour options). Transfers at fixed times between Kuusamo/Kajaani airports (1-2 hours depending on tour options) and the start/end points of the tour are included. Train from UK to Stockholm (Sweden) for ferry to Helsinki and onward train to Kajaani or train + bus to Kuusamo (depending on tour options). 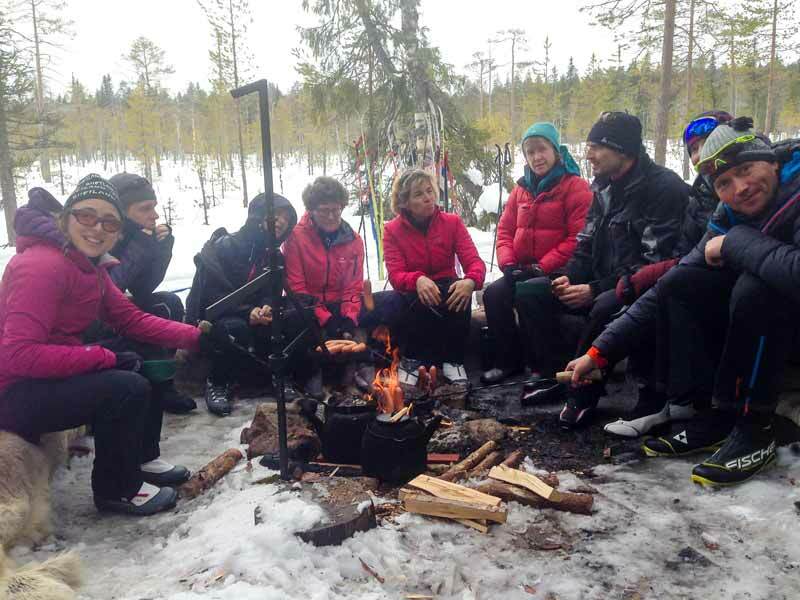 We also offer Snowshoeing in the Hossa National Park and also a summer version of this tour, Hiking in the Finnish-Russian Borderland.